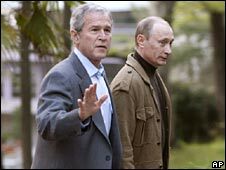 US President George W Bush and Russian President Vladimir Putin have begun what is being called a farewell summit in the Black Sea resort of Sochi. The talks come a month before Mr Putin is due to leave office. The two leaders are expected to sign a "strategic framework" on future relations between their countries. Although differences remain over US missile defence plans and Nato expansion, the summit began cordially, with the leaders joining a folk dance. US presidential spokeswoman Dana Perino said that during dinner on Saturday evening, the two leaders had got up on stage to dance with a folk ensemble that was entertaining the guests. The dinner took place at Mr Putin's holiday home in Sochi, and also included Dmitry Medvedev, who will take over as Russian president next month. Formal talks will take place on Sunday. Correspondents say the two presidents want to ease tensions. However they are not expected to clinch agreement on the proposed US missile defence system in Europe during this weekend's talks, the White House has said. Russia has strongly criticised US proposals to site a missile defence system in Eastern Europe, which would see interceptor missiles based in Poland and a radar system in the Czech Republic. Their meeting follows a Nato summit in Romania where Mr Putin - a guest at the Bucharest gathering - warned against the Western military alliance's eastward expansion. The summit also saw Nato countries agreeing to back the US missile plans during the Romanian summit. 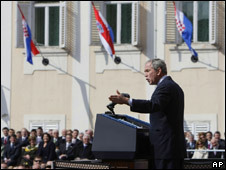 During a speech in the Croatian capital Zagreb earlier on Saturday, Mr Bush paid tribute to what he called Croatia's transition from communist tyranny to maturing democracy. He told the crowd Croatians should also be recognised for "helping the Afghan people defeat the terrorists and secure their future of liberty". "There are many people who don't appear to understand why it takes so long to build a democracy," he said. "You can tell them how hard it is to put in place a new and complex system of government for the first time. "There are those who actually wonder if people were better off under their old tyranny. You can tell them that freedom is the only real path to prosperity and security and peace." Mr Bush flew to Croatia after the Nato summit, and spent Friday in talks with its President, Stjepan Mesic. Croatia and Albania have been invited to join Nato, though neighbouring Macedonia had its bid blocked because of an ongoing row with Greece. Macedonia is also the name of a region in Greece. The former Soviet states of Georgia and Ukraine are also seeking to become members of the alliance. And, while the two countries were not offered a fast-track "Membership Action Plan" by Nato earlier this week, the alliance did leave open the option of taking in the two countries.